InPark Magazine – The Immersive Ingenuity of Attraktion! Attraktion! GmbH, a group of companies headed by Markus Beyr and based in Vienna, has introduced four new product genres in the last two years – Playoke, Dome Ride Theater, Cinesplash5D, and WeRobots – and reports having a similar number in the pipeline for the next two years. Attraktion! products are characteristically high-tech, media-based attractions, turnkey yet versatile – and each having a new twist, a new approach to integration – and near instant market impact. This estimable track record for envisioning, creating and bringing a new product and even a new genre successfully to market shows an ability to perform well all along the pipeline. The Attraktion! business gestalt evinces a confident grasp of technology, media, integration, and manufacturing; a genius for effective collaboration, bold imagination and a knowledge of global markets and marketing. Designed for out-of-home commercial use, PLAYOKE (patent pending) is scalable and readily refreshed with new content, customizable and theme-able to a specific venue, brand or IP. 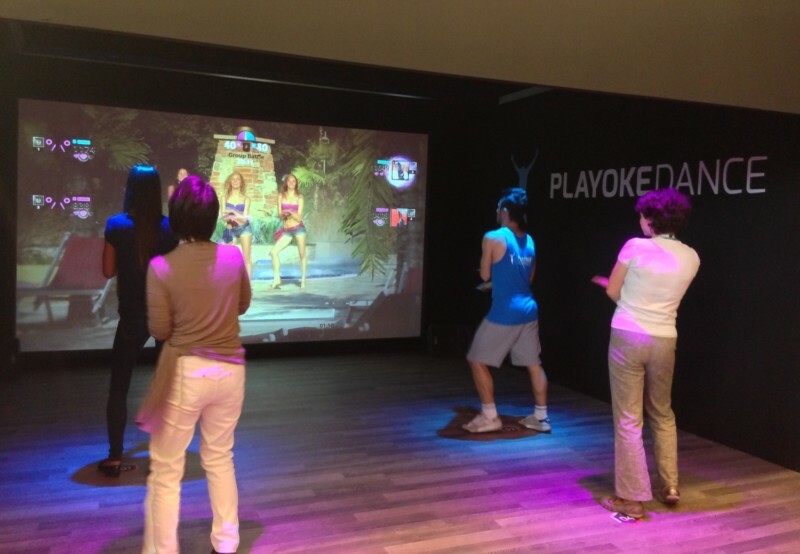 The market response to PLAYOKE Dance has confirmed its potential of PLAYOKE in leisure markets from FECs to theme parks to science centers to nightclubs. Dome Ride Theater: As a producer, Markus Beyr has been involved on numerous projects that incorporated media, motion simulation and wraparound projection. Examples include Marvel Superheroes 4D at Madame Tussauds London, the Aviation Dark Ride for the Aviation pavilion at Shanghai Expo 2010, and Arthur l’Aventure 4D at Futuroscope. 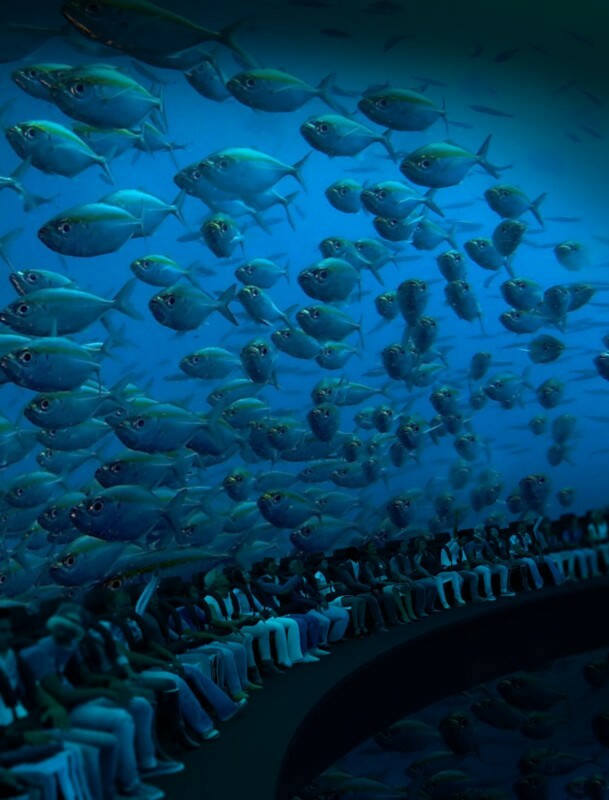 These attractions were one-offs for specific circumstances that helped prove the concept of integrating ride technology into an immersive dome theater for education or entertainment. Attraktion! subsequently partnered with a top ride manufacturer Intamin Amusement Rides, to develop the DOME Ride Theater® (patent pending, www.domeride.com), which had its official product launch at the 2014 IAAPA Asian Attractions Expo in Beijing. The Dome Ride Theater (DRT) design merges a steel ride structure with state-of-the art, full sphere projection to completely envelop the audience in seamless imagery. “The aim is to transport the audience into a unique, themed environment and a different place and time, in a format that can accommodate the kind of throughput needed by theme parks and large visitor attractions,” said Beyr. Guests enter a hemispherical space and are secured with shoulder harnesses into seats ringing the perimeter. The center floor descends and the theater becomes a full sphere. 26 concealed projectors seamlessly cover the sphere. The ring has a range of motion enabling it to pitch 30 degrees to either side while the entire seating area can likewise rotate. InPark Magazine spoke to Intamin Executive VP Sascha Czibulka at the DRT product launch in Beijing. Czibulka compared the ride system to a roller coaster, with the seating area spinning around on coaster track. Although a 30-degree pitch may not seem like very much to a seasoned coaster rider, Czibulka explained that a 30-degree angle in this configuration imparts significant G-forces that, if increased, would detract from a family-friendly design. Chinese real estate developer Lewa Investment is the flagship DRT client, and the flagship DRT installation is set to open in 2016 in Shaanxi LEWA City, a mixed use complex, in Xian Province. Attraktion! is producing the media for the DRT, which will be part of LEWA Wonderland, a cartoon-themed park. At press time, Beyr reported that a second DRT attraction was under development and would feature a major studio IP. Cinesplash5D (www.cinesplash5D.com) is a multimedia wet-theater attraction, meant to be experienced in swimsuits. When a product is branded 5D instead of 4D, we ask what the 5th D represents. In this case, it’s water. The usual range of 4D effects – lighting, lasers, fog, audio, wind, etc. are joined by water effects that put everyone in the splash zone, allowing guests to get wetter than any theater-goer has been before. “A full range of never-before-seen effects in a 4D environment have been engineered by Attraktion! – from water explosions to theater flooding,” said Beyr. Like other Attraktion! products, Cinesplash5D is scalable and customizable: from 20 seats up to more than 100 seats, suitable for indoor or outdoor venues, and packaged to suit the client’s choice of media, projection, animated seats, motion base and in-theater effects. 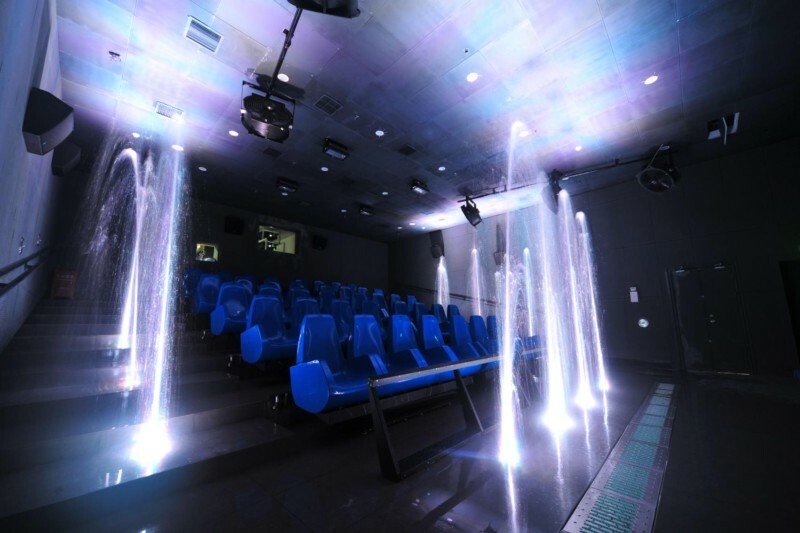 The newest Cinesplash5D installation is a 40-seat theater that opened in 2014 at Ningbo Hangzhouwan Dream Hotspring Water World in Ningbo, China. Markets for Cinesplash5D include waterparks, spas, resorts, zoos, aquariums and marine parks. Some venues will elect to offer such a theater as a separate ticketed, standalone attraction and the package Attraktion! provides can also include assistance with marketing, promotions and operations. Attraktion! is building a custom media library for Cinesplash5D theaters beginning with ‘Storm Riders,’ which Beyr calls “the world’s first aquatic cinema title.” A version will be availablefor regular 4D theaters as well, in spring 2015. WeRobots: First introduced to the retail market at the MAPIC show in Cannes (which dedicates an exhibition zone to Retailtainment), and at Euroshop 2014 in Dusseldorf, WeRobots (www.werobots.com) made their leisure industry debut in June at the Asian Attractions Expo in Beijing. “Retailtainment” is the new differentiator to make a shopping mall stand out – to attract retail tenants and to give consumers a reason to go offline and shop at a bricks-and-mortar establishment. WeRobots are the mobile, interactive service robots developed by Attraktion! to help achieve that. At the Red Star Macalline shopping center in Shanghai, 50 WeRobots are moving around, guiding and entertaining visitors. 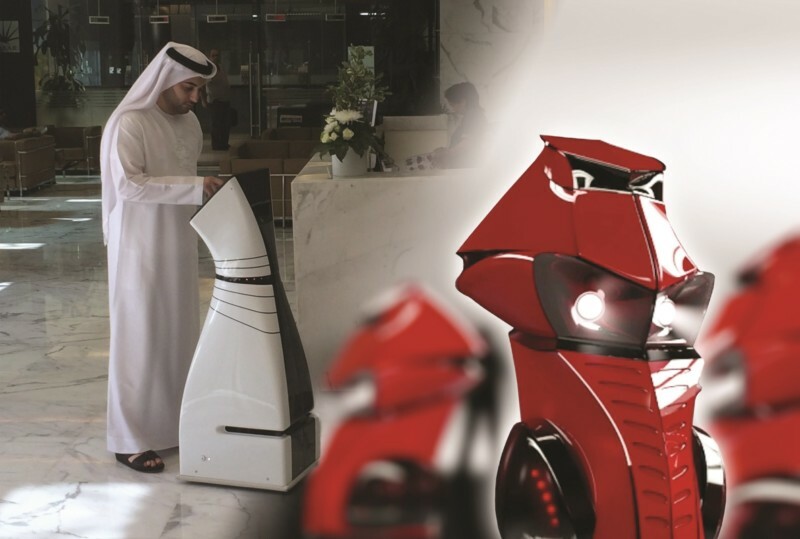 In Dubai, is using WeRobots as visitor guides at its Customer Care Center. What WeRobots are doing for retail, they can do for theme parks, brandlands, science centers and other out-of-home attractions: Provide a differentiator, reinforce branding, raise visibility, drive traffic, garner press attention and engage and inform the customers. “WeRobots fit into any place where visitors and customers are seeking entertainment, information and guidance,” says Beyr. Beyond their diverse functions, the “guidance” feature enables WeRobots to deliver quite personalized service by accompanying visitors to their point of interest. 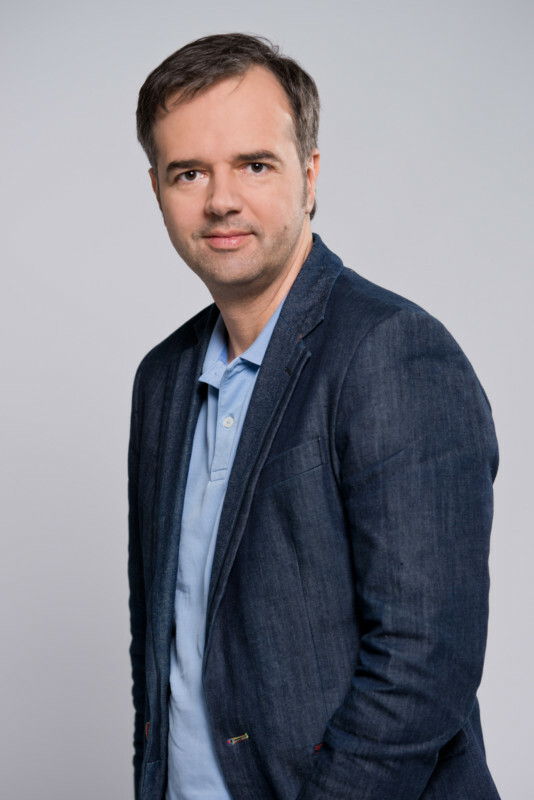 They can also gather together and put on entertaining group performances, which Andreas Bley, Managing Director of WeRobots, points to as one of their unique, distinguishing features. WeRobots communicate with one another and interact with people in their environment. Their social skills are supported by an ability to orient themselves by measuring 3D space, identify humans and speak virtually all languages. Each is equipped for versatility with touchscreen, camera, and microphone, sophisticated content management system, RFID chip and telepresence capability. The standard shape and appearance can be customized, and WeRobots can act as central showpieces in theme parks. A new, more abstract Robot/Race Car Design will become the second version available. is one of Attraktion!’s competencies. 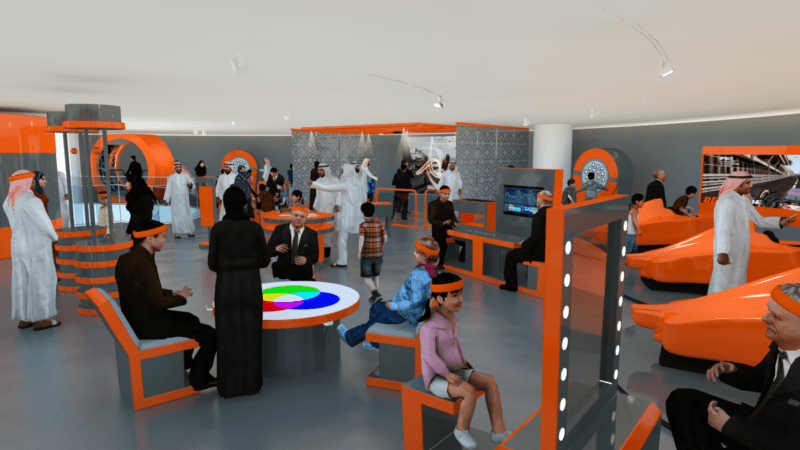 Virtuality Center“ in Riyadh (Saudi Arabia).